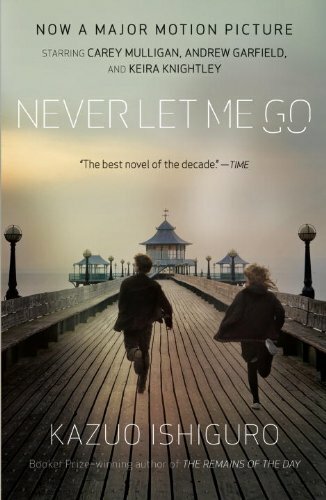 Mark Romaneck's film of Kazuo Ishiguro's 2005 novel Never Let Me Go is, if watched in the right frame of mind, a heart-rending experience, much like a good disease-of-the-week movie. We know the main characters will suffer and emote, that they will grapple with cruel fate, that they will behave badly and wonderfully on their path toward ultimate redemption and Meaning In Life. Kazuo Ishiguro is credited as an executive producer on Never Let Me Go and novelist/screenwriter Alex Garland (best known for The Beach and the script for 28 Days Later ) is credited as writer. Never Let Me Go is, then, further proof that novelists who turn novels into movies generally help create movies that are, at best, mediocre. Such movies end up feeling, to anyone familiar with the source material, like summaries of the Cliff's Notes version. Ishiguro is a particularly difficult writer to adapt because his novels so often employ deluded or ignorant narrators. In Never Let Me Go , the narrator is Kathy H., who spent her childhood in blissful ignorance of her fate. The novel is full of testimony and talk, and part of its power comes from Kathy's struggle to find a way to tell a story that will represent her reality and imbue purpose and meaning to her life beyond the purpose and meaning given it by her creator(s). Garland emulates the first-person narration of the novel with Kathy's voiceover in the film. Voiceover is a tricky technique, at its worst a bludgeon against the viewer's intelligence, but at its best (cf. the films of Terrence Malick, the documentaries of Werner Herzog, etc.) it can be as evocative and essential as any other cinematic element. The voiceover in Never Let Me Go is, with one exception, neither particularly effective nor particularly offensive. The exception comes at the end of the movie, where Garland suddenly decided, apparently, that he was writing a fable for young children, and he should make sure they understood the moral of the lesson. It is a movie-ruining moment, worse than anything in Harrison Ford's voiceover for the original theatrical version of Blade Runner . While including plenty of voiceover, the filmmakers missed the point of Ishiguro's narrative. The egregious smack-on-the-nose of the final moments shows they got one of the main themes (a theme Ishiguro never announces so blatantly), but they missed the essential role that talk and testimony play in the novel. This obtuseness ruins one of the late scenes, where Kathy and Tommy confront the people who ran the boarding school that raised them. The film turns this scene into what it only superficially was in the novel: an excuse for exposition and revelation. It's a much longer scene in the book, and many readers saw it as a clumsy bit of infodumping, but that's not its purpose at all. Nothing that is said in the scene is a particular revelation to us, the audience. It adds some details, but nothing to justify its length and centrality to the final section of the book. Instead, the function of the scene is to portray delusion in a variety of forms. Kathy and Tommy become disillusioned; Madame and Miss Emily fortify the walls of their self-justifications. This section of the novel is filled with such sentences as "We have to talk with you," and "I spoke to her honestly and simply," and "I told her what we'd heard," and "You speak to them. It's you they've come to speak to." We make meaning in our lives through the stories we tell, and sometimes the stories we tell create excuses for cruelty that would cause us otherwise to see ourselves as monsters. Such is not the effect of the scene in the film, in which it is abbreviated and attenuated, with Kathy and Tommy as its center of gravity rather than Madame and Miss Emily. Never Let Me Go displays more virtues when divorced from adaptation, evaluated solely as a film in its own right. Its power derives from its unity of purpose—every item of mise-en-scene, every shot, every stitch of clothing contributes to a melancholy mood. Even the sunlight seems sad. The acting is strong and focused. Keira Knightly's performance impresses because it allows her to nurse an aciculated nastiness that she's seldom been able to show before. Andrew Garfield is an actor I've been enchanted with since his performance in the small British film Boy A , where he was riveting despite a script that self-destructed in the second half, and he has since gained notice in The Imaginarium of Doctor Parnassus , Red Riding: In the Year of Our Lord 1974 , and The Social Network —though he may be most famous at the moment as the announced next Spiderman. He's an actor defined by two qualities: a nervous stutter and a gangly body, both of which he uses well, giving his characters an off-kilter unpredictability that enlivens even a relatively nondescript role such as that of Tommy. Carey Mulligan as Kathy H., though, is the star of the movie, its narrator, focus, and organizing principle; her character isn't as attention-grabbing as Knightly's or as vividly embodied as Garfield's, but she and Romaneck have the good sense not to try to make her into something forceful or show-stopping—she is an actor who lives through her eyes, and the hair and make-up of Never Let Me Go set those eyes in a teddy bear face that allows us to understand the other characters' frustrations with her and also their love for her. That the film conveys moments of emotional experience other than the rigorous melancholia of its colors, shapes, and shots is very much because of Carey Mulligan, whose performance is not merely subtle, but offers a foil for the other actors to work against. We haven't spoken of the plot. You don't know yet why this is a science fiction movie. Or maybe you do—maybe you've read the book, read some reviews, heard a bit of gossip, made a good guess. There is a Surprise, but it's not a Surprise, it's a MacGuffin. The movie doesn't work very hard to hide its MacGuffin. The novel had other things to do, but the film needs to get the MacGuffin out in the open before the movie can be what it wants to be. The story scampers to the moment when the great Sally Hawkins, as Miss Lucy the renegade teacher, reveals to the young children in her class at the Hailsham boarding school that they are, in fact, clones. They have been brought into the world to provide replacement organs for non-cloned humans. A title screen at the beginning of the film already set us up for this. We are told both that the tale takes place decades in our past and that science has extended human life beyond 100 years. (Compare this explicitness to the three words given a page of their own at the start of the novel: "England, late 1990s".) Before we even enter the story, we know this is an alternate history. The film isn't particularly interested in clues and revelations; it's more concerned with quotidia, determined as it is to get to the final, banal moral. Epistemology and metaphysics get dropped like vestigial limbs. The movie just wants us to know the sad fact that life possesses whatever meaning we give it. Of course, it's bad form to review a movie that might have been, but I can't help wishing Never Let Me Go were more carefully and deliberately a deconstruction of the sort of film associated most prominently with the Merchant Ivory production company. I don't know why this is, exactly—why I feel such antipathy toward such films as Howard's End and The Bostonians , among many others: films of quality that know themselves as films of quality, that fill their frames with the decor of quality, that garb their actors in the costumes of quality, that illuminate each scene with the light of quality (and not just Merchant Ivory films, either, for quality spreads, like a kudzu clone, to such twaddle as Atonement ). Perhaps my aversion originates with an earlier Ishiguro adaptation, the Merchant Ivory production Remains of the Day , which didn't merely narrow the source material, as Never Let Me Go has done, but mangled it, rendering its meanings into nonsense and sentiment. Harold Pinter wrote the original draft of the script for Remains of the Day before Ruth Prawer Jhabvala was brought in to add quality to Pinter's subtleties, and Pinter took his name off the film. Pinter would have rendered a more nuanced, complex, and subtle Never Let Me Go than Alex Garland did. He would, as he always did, pay proper attention to the ambiguities, the diction, the silences (cf. The Go-Between ). Pinter and Ishiguro have much in common as writers. Perhaps I imagined this other, better Never Let Me Go simply because I cannot bear the truth that Harold Pinter is dead. But no, it is not just that. The tradition of quality cinema prescribes seriousness but employs such self-consciously tasteful techniques that, paradoxically, the result is high-toned kitsch: films so controlled, so well-behaved, so house-broken that they are emptied of any but the most obvious meaning; simultaneously, they are insistently proud to display how very meaningful they are. But meaning, if it is to have resonance, is a complex pattern of hints and clues, not a fortune cookie slogan or a gusty exhortation. It thrives on ambiguity and oddity, on symbols and themes that aspire to be not billboards but shape-shifting shadows. Examples are more helpful here than generalizations. While watching Never Let Me Go , I repeatedly thought of a stranger film, one far more unsettling: Lucile Hadzihalilovic's 2004 Innocence , an adaptation of Franz Wedekind's 1901 novella Mine-Haha: On the Bodily Education of Young Girls . Like Never Let Me Go , Innocence tells the story of children at a boarding school, a school with odd rules and rituals, but it is vastly more surreal in its approach -- less concerned with simulating reality than evoking a sense of estrangement, of unreality. It is unfair to compare Never Let Me Go and Innocence , because they have no more desire to be each other than Star Wars wants to be Solaris (or vice versa), but my mind brought them together nonetheless, and the juxtaposition highlighted for me just how obsessed with its reality effects Never Let Me Go is. It does not have explanations for the absurdities of its central premise, but it is very careful to project an aura of plausibility, to feel like a kitchen-sink melodrama more than a lyric poem. Its greatest effects, though, are lyrical. It's been weeks now since I saw Never Let Me Go . I've been tinkering with this review the entire time. I've probably thrown out twice as much as I've kept here. I didn't intend to put myself into these sentences when I began, but it seems to me now that here, in my struggle toward expression, sits the most accurate and honest assessment I can offer of the film. Carey Mulligan's face still lingers in my memory, more than any single scene, more than any bit of dialogue or situation. The grey sheen of the shots still hovers over the recollected fragments. The texture of melancholy returns whenever I think of the title, Never Let Me Go . The clunky moral at the end of the movie doesn't bother me now as much as it did moments after the credits rolled. Annoyances fade. Even my imagined alternative movie, scripted by Pinter, isn't as present in my mind as Carey Mulligan's eyes. The sadness in them, the perplexity, the weariness. The yearning for someone to say that life is something more than mere biology. That is what remains: those eyes looking out at a horizon, seeking meaning.